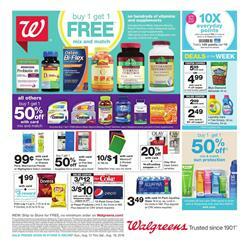 Walgreens Ad is one of the most consistent online deals. Every week, we can see a great product range and awesome deals on the most needed products of a family. Today, you can find household products like bathroom consumables, air fresheners, laundry chemicals and more. Go to pg 10 for a nice deal on dog and cat foods. You can find pet care products like training pads. Wphoto deals are also available on that page. Get 30% off Canvas prints, 4x6 prints for only $.15, 25% off photo cubes and gifts, 30% off enlargements posters. Don't miss out these interesting ideas for improving your daily life. In-ad coupon savings will also be profitable for the most of customers at Walgreens Ad.